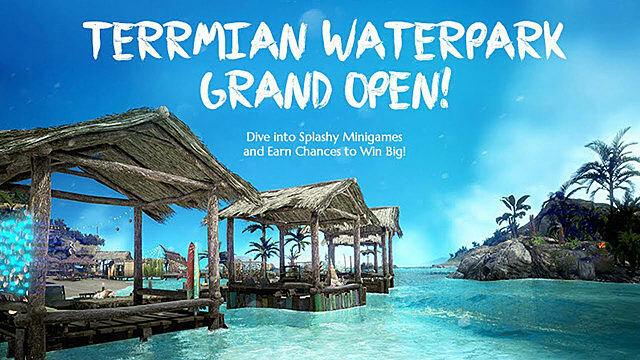 Black Desert Online has a new event, called Terrmian Waterpark, that will last until August 30. This particular event offers some special prizes, including Blessing of Kamasylve, Value Sets, Dark Thorn Fishing Boat, and many others. However, the opportunity to win these prizes will be open only until August 9. As of now, the Terrmian Waterpark event offers daily quests that will open an opportunity to play six mini-games that may reward you with some really exciting items. If you want to know how to get them all, then bookmark this guide, so you can find it quickly. 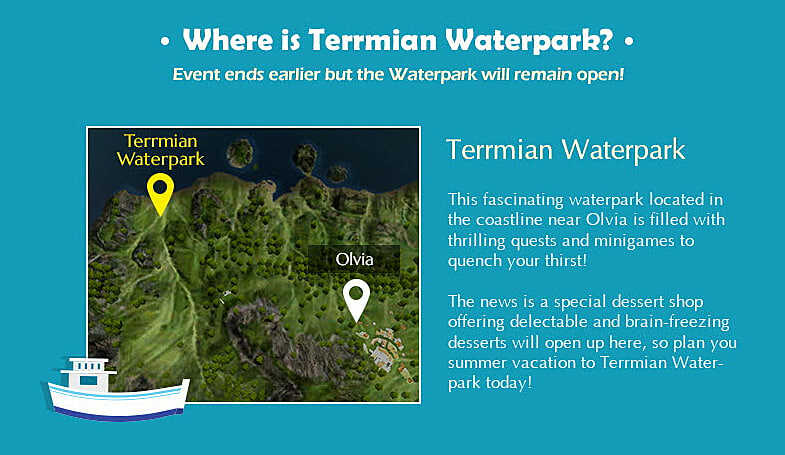 You will find the location of the Terrmian Waterpark on the coastline to the north-west from Olvia. As soon as you arrive at the beach you will notice an area surrounded by the palm trees and inhabited by many NPCs. 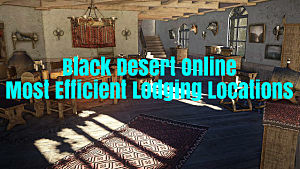 You can go and talk to them and some will give you quests that can be played once every day and reward Terrmian coins. These coins can then be traded for mini games that reward Terrmian seals. Finally, with the help of seals you can purchase special prizes and items. You need to go straight to the docks and speak to Captain Moguly, who will ask you to clean up the shore from all the garbage that has been thrown in there by the visitors of the park. Buy a fishing rod from him and equip it. Start fishing on the coast either manually or by using the auto-fishing option, but be sure to filter out all the useless stuff that you get. In order to complete this quest, you need to fish Tattered Boots and Torn Net. Locate the Juice Shop Merchant on the beach and talk to him to get this quest. He will need some decorative leaves for his juices. Walk around the beach and gather 10 pieces of herbs of various types that you will be able to find. 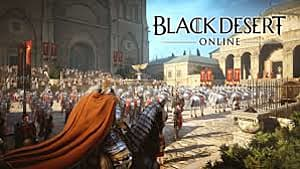 Bring them back to the merchant and get your coins. Near the Juice Shop you will find another NPC with a quest for you -- Restaurant Server. He will ask you to find the order from one of his clients that he lost somewhere on the beach. For this quest, you have to go back to Olvia and find Nadia Rowen -- a local chef. She will ask you to bring a box of lunch that she has prepared for a few NPCs that reside on the Terrmian Beach. 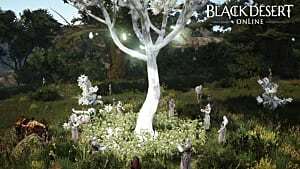 The quest will mark all the NPCs involved, so you should be able to find them easily. If you wander around the beach for a while, you will notice a place with sandcastles that serves as the playground for little kids. However, their caretaker, named Brodt, is devastated that he lost one of the children. He will ask you to find a girl named Chi Chi. In fact, the girl didn’t disappear, she simple fell asleep on the rug at the tent camp, so go get her there. In the last daily quest, a shop owner on the beach named Gargat will ask you to bring him some timber to decorate his newly opened shop. You will find the cart with the timber on the marked location on your map. Go there and bring that cart back to Gargat. When you have at least one Terrmian coin in your possession, you can find Giorio on the beach, and he will sell you five coconuts. You can use the coconuts to pop up giant clams that are hanging on the tree in the middle of the park. Note that clams appear only for a short period of time -- so if you don’t see them right away, just come back in a few hours and they should be there again. Throw the coconuts at the clams until they open up and pick up any items that the clams would drop. Locate a pirate named Rose on the Terrmian Beach that will offer a Coconut Cannon Assembly Fit for 5x Energy and 5x Terrmian Coconut Cannonbals for a Terrmian coin. 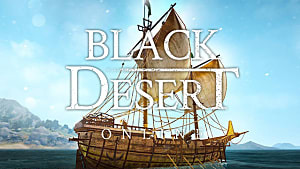 You will then need to hit at least one of the pirate scarecrows that are floating on the surface of the water at the coastline with your newly acquired kit in order to receive a special prize from Rose. You will aim better if you keep your Shift button pressed at all times. The farther the scarecrow floats, the higher your cannon must aim. Press and hold LMB for the cannonball to reach farther targets. Go up the Terrmian Cliffs and locate a diving board. When you walk up to it, press the R button and you should be ready for the diving. By pressing the space bar you will perform a simple straight dive. If you press an S button while jumping, you will perform a sprint dive. Talk once again to Captain Moguly at the docks. He will give you a new task that involves a ghost ship appearing on the coral reef. Swim to the Terrmian Cliffs and light up Pure Powder Reagant and fire up the Beacon Mound. Then, a new quest will pop up -- Reward for Valor. When you accept it, the ghost ship will appear, and you will need to swim underneath it to obtain the necessary quest objective, the Growling Box. 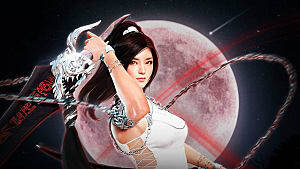 As a reward you will receive a random prize from the ghost ship’s treasure chest. You will find another NPC at the Terrmian docks -- Harrio. He will offer to test out your shooting skills at the Shooting Range nearby. 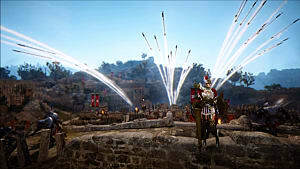 Exchange your Terrmian coin for his Matchlock and go shoot some Terrmian Wing Balloons floating above the water. Drive Out Terrmian Possessed Spirits! Do you remember the girl Chi Chi that you found sleeping on the rug? Find her there again and accept a new quest from her. In exchange for your coin she will give you a fruit. Take the fruit and throw it at the flying spirit around the waterpark. It looks exactly like a flying balloon that you’ve been shooting in the previous mini game. Remember that each mini game rewards Terrmian Seals that can be exchanged for some really cool prizes. So claim them as soon as you have enough for the prize of your choice. Check the prices in the table listed above. 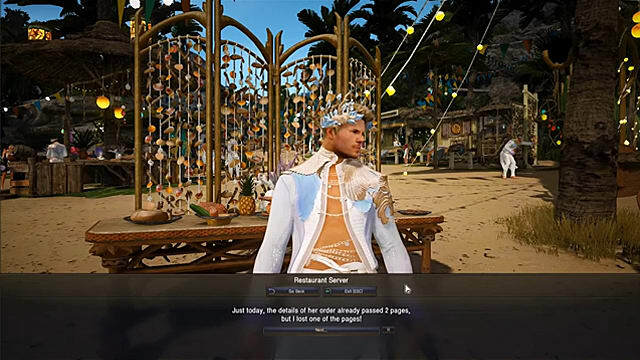 Lastly, you can exchange 10 seals for a Terrmian Festival Entry Coupon event that will last until August 9. And if you are lucky, you can win one of two GeForce GTX 1080ti graphics cards from Square Enix. So make sure that you have enough seals for such a great event.